Interviews and photos by Carolyn Eicher. 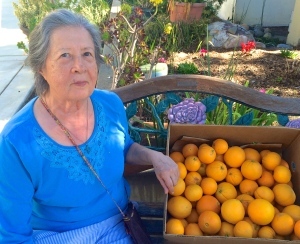 Our GleanSLO interview this month features two residents in San Luis Obispo from Judson Terrace Homes which provides affordable housing for seniors 62 years and older. The Food Bank’s “Free Farmers’ Market Style” distribution is being held in the courtyard of Judson Terrace on a monthly basis since September of 2014. Most seniors are living on a fixed income and find it difficult to adjust to the ever increasing cost of living. Low income seniors comprise 20% of the Food Bank’s consumers. Senior farmers’ markets will help increase access to nutritious food to keep the fastest growing demographic in our community healthy and strong. 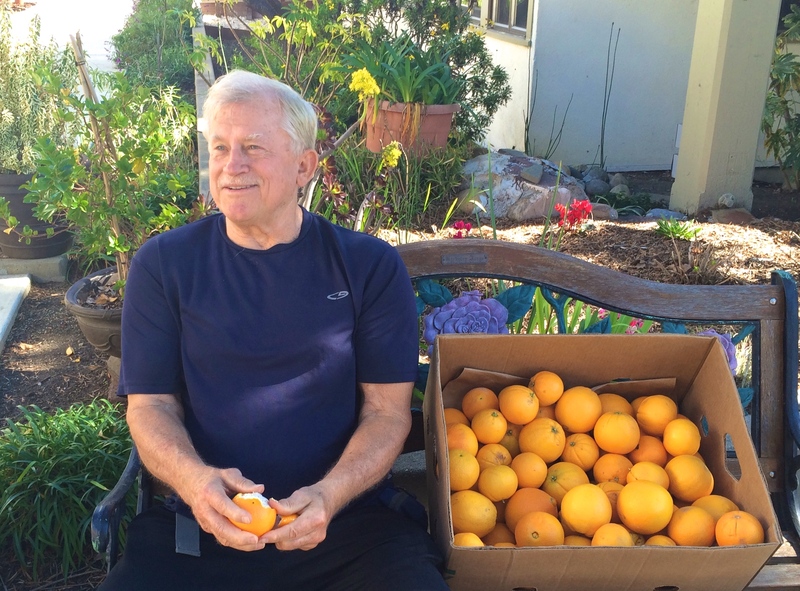 The day of our interviews, gleaned navel oranges from a local property in Arroyo Grande were being distributed, only 4 days after the glean, along with bunches of spinach, broccoli, onions, potatoes, carrots and more. 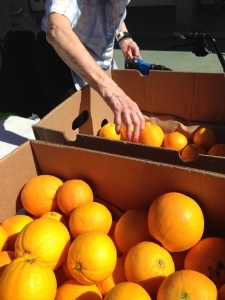 Judson Terrace residents gathered and perused the tables of assorted produce, loading bags and push carts with the fruit and vegetables of their choice. Volunteers helping at the farmers’ market distribution enjoyed telling the story of the gleaned oranges and recipients gladly bagged oranges, hand picked, just for them. 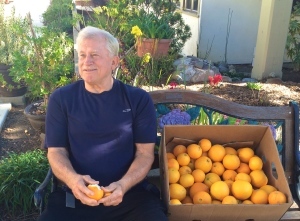 Paul, pictured here, shared his enthusiasm for the produce he receives from the monthly distributions which often includes local produce from GleanSLO. He particularly enjoys local, and preferably organic produce. During the interview, Paul shared his interests in healthy food and used the term, “health nut” to describe himself, as he takes pride in being healthy and physically active and eating well. Maria has also been receiving food distributions from the Food Bank and enjoys cooking for herself and her husband as well as other residents at Judson Terrace. Maria frequently makes soup from the produce she receives and shares often with ill residents or those who may not be able to make their own meals or get out easily on their own. 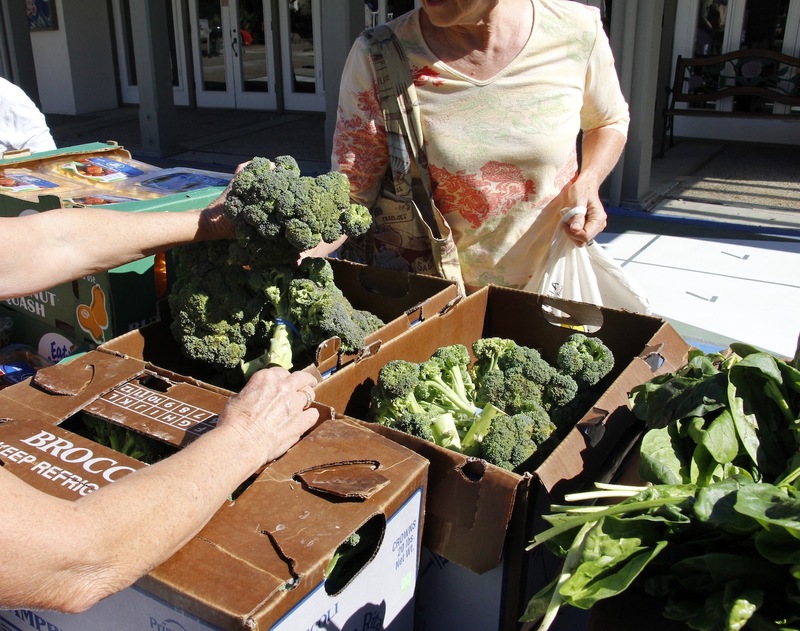 The farmers’ market style distributions are the SLO Food Bank’s fastest growing model to distribute fresh produce. The farmers’ markets have been extremely successful, offering a wide range of produce and the option for consumers to choose which items they prefer. Check out the Food Bank website to find a food distribution near you or to learn more about the Farmers’ Market Distributions. This entry was posted in GleanSLO Interviews on 02/23/2015 by gleanslo.